Last time we learned about orbits, this time we'll look at what I believe to be some interesting maneuvers spacecraft have used, both in real space missions and in science fiction, to go from planet to planet or to change orbits. Read on! Well, it has been entirely too long since I wrote a post here, but it has been a while since I last played. Tonight, I played a thrilling session of Dungeons and Dragons, probably one of the best of my life, and it was so exciting that I was compelled to start writing this blog post at 1am. There are different ways a satellite can orbit the Earth, each having specific uses and benefits. While researching this, I found several websites covering this material which you might find interesting; namely, How Stuff Works look on satellites and Radio-Electronics's look at Satellite Orbit Types and Definitions. I cover much of the same detail here, but streamlined as much as I can. The first orbit to consider is the Low-Earth Orbit, or LEO. Usually considered for a satellite with an altitude between 200-1200 km, these satellites move the fastest, usually around 8 km/s. As a result, they complete more orbits in a day, and are usually used for Earth observation. Some communications satellites operate in LEO with the added advantage being that the time it takes for a signal to go from ground to satellite and back is shorter. The disadvantage here is that the satellite will not be in the same place for long. The International Space Station orbits roughly 350 km up and completes an orbit around the Earth in 93 minutes. And the Hubble Space Telescope is up around 600 km, completing an orbit every 97 minutes or so. Earth observation missions often use a low-Earth orbit. By keeping the satellite as close to the ground as possible, the imaging equipment usually obtains a clearer study of the area. Because of the nature of satellite's in LEO, namely that they move very quickly, either different parts of the Earth are observed in the same orbit, or the same area is looked at several times a day. Some communications satellites use LEO as well. A group of satellites, called a constellation, is used so that when one satellite moves away, another has moved in to take its place. 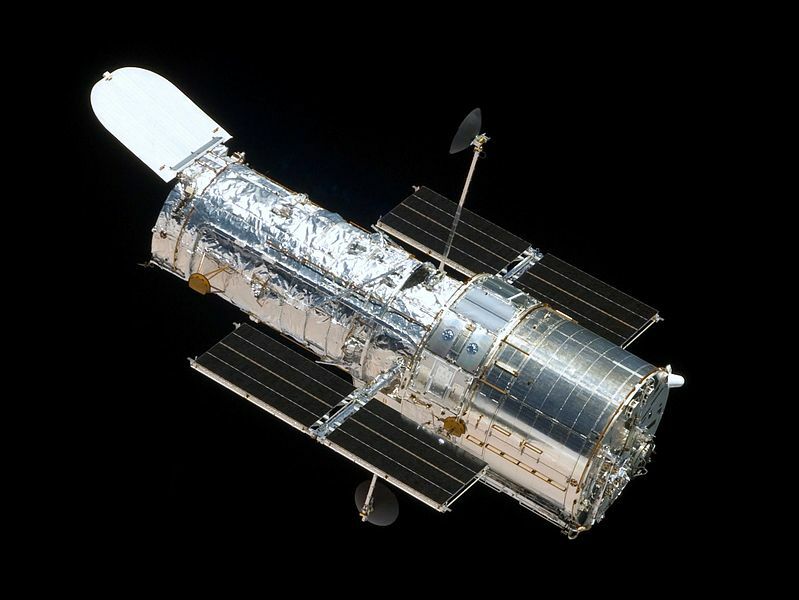 For more information on this, check out the Iridium satellite constellation. Medium-Earth Orbit, or LEO, is exactly as it sounds as well. Located roughly between 2 000-35 000 km above the Earth, this orbit houses many satellites used for navigation, communication, Earth observation, and most famously, the Global Positioning System satellites. 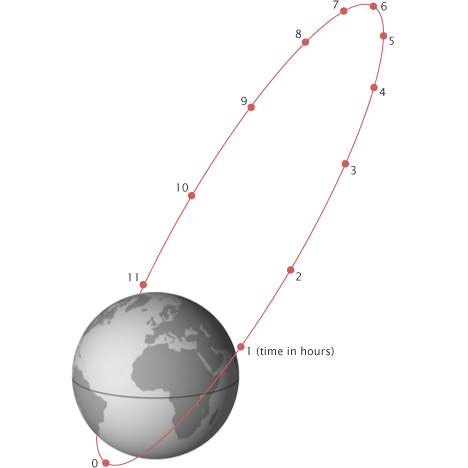 As mentioned last time, the farther a satellite is from the object it is orbiting, the slower it goes and the longer it takes to complete an orbit. While satellites in LEO take about 90 minutes to complete and orbit, those in MEO take about 12 hours. The third general orbit to consider is the Geostationary Earth Orbit, or GEO. This one is pretty important, especially for telecommunications. Contrary to the other orbits mentioned above, a geostationary orbit attempts to place a satellite directly above a spot on the earth and, you guessed it, remain stationary above it. Why is this important? 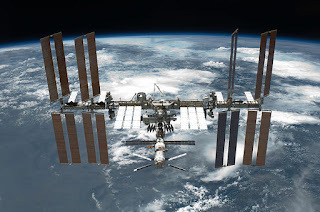 Well, for a world becoming smaller and more interconnected through telecommunications, whether it be TV, internet, or phone, geostationary satellites are becoming more and more important because of how they make such communication work. For example, for a while, I was living in Edmonton, yet my family lives near Ottawa. When I wanted to call them on my cell phone (thankfully, I have a great long distance plan), I simply push a couple of buttons and like magic I am instantly communicating with them. As you may or may not know, what basically happens is that my cell phone sends out a signal which contacts the nearest radio tower. This tower, as long as my phone has rights to use it, sends its signal to an antenna somewhere. This antenna directs that signal toward a satellite which re-transmits the signal back down to an antenna in Ontario, and the steps reverse themselves. For the sake of keeping things simple, there are only two characteristics of orbits we need to consider: the altitude and the inclination. Put simply, a satellite's inclination is the angle its orbit makes with the Equator. Thus, a satellite orbiting above the equator has an inclination of 0°, and one which crosses over the north and south pole has an inclination of +90°. An example of this is shown in the video below. Using a program called Universe Sandbox, I created a simulation of the Earth with two moons. The first moon has an inclination of 0°, and the second has an inclination of 44°. For anyone paying close attention, you'll notice that the angles are off because the one at 0° should be revolving around the Equator and yet it is not. That's simply because the view in Universe Sandbox is not level with Earth's rotation, but rather its path around the Sun. Geostationary satellites are required to orbit as closely over the Equator as possible in order to stay positioned over the same location on the Earth. Thus, satellites in this orbit have an inclination no larger than a couple of degrees. With these limits to their inclination and altitude, as more geostationary satellites are put into orbit, the space they occupy is getting more crowded. Another special type of orbit, one which depends more on inclination than altitude is the Molniya Orbit. With the space race beginning with The Soviet Union's launch of Sputnik in 1957, Russia and its surrounding territories were some of the first to realize the awesome potential of having dedicated satellites overheard. Surveillance, communication, navigation, even television broadcasting, all could be made easier using satellites. However, much of The Soviet Union exists far north of the Equator and thus geostationary satellites may not be as useful. What they needed were dedicated satellites with high inclinations so that they could be covered. But, if you launched a single satellite into LEO, it would fly around the Earth too fast to be of good use. So, what can one do? Well, you remember Kepler's laws? Remember how orbits are elliptical, and the farther a satellite is, the slower it moves? Well, the ingenuity of The Soviet Union remembered and used these laws to devise the Molniya Orbit. By placing a satellite into a high inclination orbit, and by making the orbit highly elliptical, they could have a satellite which spent most of its time above their homeland. And when the satellite did happen to go around the Earth and lose contact, its closer proximity caused it to shoot around the Earth faster, coming back into communications range much sooner than a satellite in a more circular orbit. And there you have it; not an exhaustive list, but a sampling of some of the more important orbits used everyday. The choice of orbit depends on a lot of factors, but the first one to consider is the subject, or the purpose of your mission. Space mission design is all about considering every path, every option, and weighing them against each other. As we continue, I'll get into more detail as to some other considerations for working in space.